The Christian County Library has online resources, free to use with a library card, that can help you grow your business in 2019, including a business plan wizard, a curated collection of business articles, a tool that can run detailed demographics reports, free online classes on a wide variety of topics, and more. 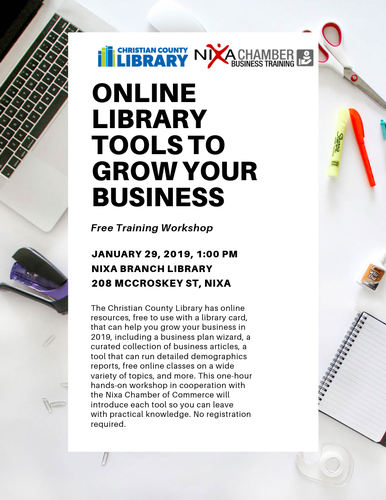 This one-hour hands-on workshop in cooperation with the Nixa Chamber of Commerce will introduce each tool so you can leave with practical knowledge. No registration required.